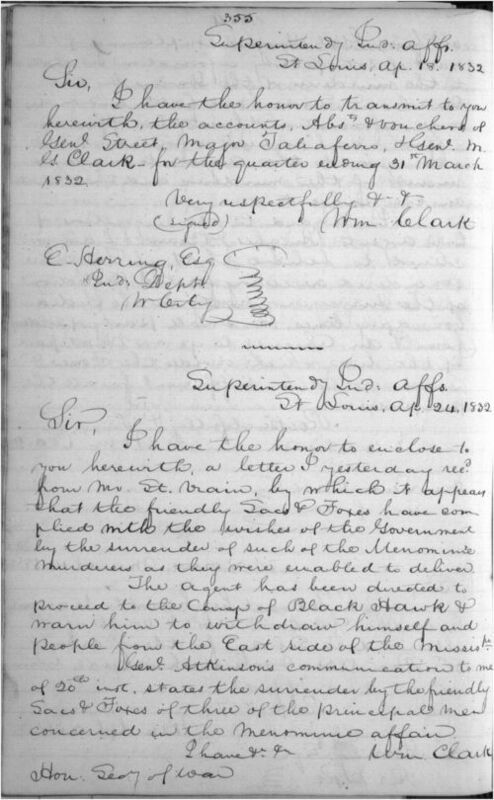 William Clark, Superintendent of Indian Affairs, wrote this letter to the Secretary of War Lewis Cass, informing him that Indian Agent Felix St. Vrain was en route to the camp of Black Hawk's followers to inform Black Hawk that the Sac and Fox must move to their new lands west of the Mississippi (into present-day Kansas). Black Hawk, a warrior of the Sac and Fox, resisted removal after his tribe ceded their land to the U. S. government in 1804 and 1816. The letter also mentions that the Sac and Fox have turned over to the government the members of their tribe that were accused of murdering some Menominee Indians. This short letter is a powerful reminder of how native peoples resisted removal, and it could be used to teach the Black Hawk War. This source could also be grouped with two other letters from the William Clark papers (dated May 20, 1829 and May 1, 1832 respectively), and the portrait of Black Hawk selected for this standard.